Our drawer of old technology is nearly empty. In an effort to test out as many of the UK mobile phone recycling firms as we can, we’re sending off our old mobiles to find a new life elsewhere. Today, it’s the turn of Money For Your Phone to get tested. This company has a slight variation on what some of the other companies in this crowded space have to offer. Sure, you can return your phone for some cash, but you can also swap your phone. For this, you send off you old phones, select a new phone, and pay the difference. For this review, we’re not testing out their trade -in service, as we’re doing a like-by-like comparison with the other providers out there. 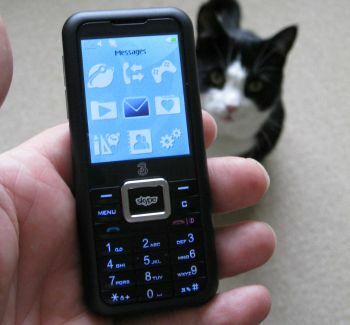 For this review, we’re looking to sell on our old Amoi WP-S1 Skypephone. We picked this up a few years back on PAYG from 3. 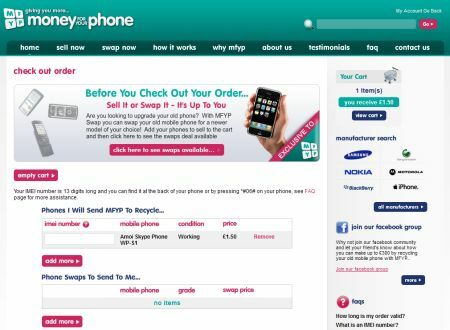 We used our Sell Your Old Mobile comparison tool, to be told that Money For Your Phone would give us £1.50 for the handset, which was enough for us to make it worth a test. Entering the details in the site is very straightforward. It’s a case of entering the make and model into their website, then entering the serial number (the IMEI). Next, comes setting up the account – requiring name, address, date-of-birth and phone number. The options for payment are more limited than some of the services we’ve reviewed, but perfectly fine for most. You can be paid by bank transfer or into a PayPal account. There is no option for a payment by cheque, which is a little odd, as their website’s “How it Works” section shows what looks a little like a cheque as one of the steps. Money For Your Phone - To cheque, or not to cheque? Once all of the steps are complete, it comes to returning the phone. The site recommends sending back using Royal Mail Recorded Delivery for less than £30, or Special Delivery for more expensive mobile phones. There is an option to request a Freepost envelope when your order is nearly complete. As our phone is only worth £1.50. This appeared within 2 days. 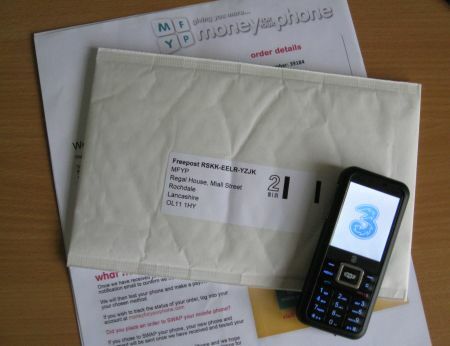 We posted our phone off on the 20th July 2011 using the Freepost envelope (2nd class), and we’ll wait to see what happens next. Two days aftyer posting, we got an email confirming that the phone had arrived safely. It took them six days to test the phone and report that a payment was authorised. Then, a further week for the payment to be transferred to our bank account (arriving on the 4th August). The service from Money For Your Mobile was fine. No problems with the transaction. In our test, they were one of the slowest of the services we reviewed as it took almost two weeks from them getting the phone, to us getting paid. Still, the process worked, and we’re not complaining. Money For Your Mobile were slower than most and don’t offer a payment by cheque option. They also weren’t offering the best prices out there, but the service worked. They are the biggest scam ever! 1. they quote you a price of £50. 4. you’ll receive an email saying the money it’s on its way. 5. you realize that they paid you for a faulty phone (usually 1/5 of the original quotation). 6. you complain nothing happens. 7. they end up with a working phone for 1/5 of the cost! Money For Your Phone (www.moneyforyourphone.com) are crooks. I sent them a perfect (honestly, perfect) iPhone 4 32 GB and they “tested” it. After cutting the price in half, I rejected their offer and had them return the phone to me. It came back in a flimsy (I mean a joke) package. It was damage, screen cracked. I had sent it to them in triple layer bublewrap, in a box. No way it was damaged when I sent it. Either they broke it there, or in their crap return. These guys are really a dodgy outfit. If you choose to use them, do so at your own risk. Not recommended. AVOID! They offered me the best price in the market for my Ipad but their very questionable business methods were unveiled when they received the Ipad. I received an email where they said that the have revised the offer down by £88. Shortly after declining their offer I received a new offer “only” £66 less than they had offered me. I would strongly recommend to AVOID Money For Your Phone as their business ethics are not existing. DO NOT USE Moneyforyourphone. They will rip you off! I sent them my Nokia Lumia 800 after they offered me £36 for it, the phone was in mint condition as I always take great care of my phones. They sent an email to advise they had received the phone and another after a few more days to advise they had revised their offer to £18, half the original offer due to the screen being badly scratched (I don’t think so!) . I promptly rejected the offer, several days later they sent another revised offer of £25 or it would cost £6 to £9 to return the phone to me. So no brainer I sold the phone £11 less than originally offered. I was ripped off !! Never use Moneyforyourphone again…..